My data set project turned out a lot different from what I envisioned. I found my data from the Integrated Postsecondary Education Data System (IPEDS). They have a Trend Generator System, which easily helps you generate data, and you can see how this data changed over time. 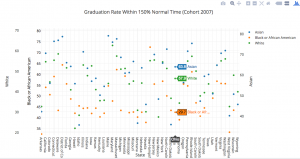 So, I looked at the percentage of bachelor students who graduated within 150% normal time (6 years) at 4 year postsecondary institutions in cohort year 2007. I broke the data down by state and race/ethnicity. The black and red bubbles aren’t really points…. 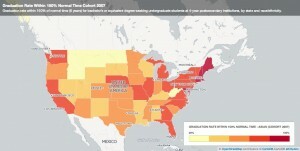 Then I tried to create another map, a choropleth map. 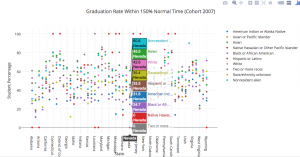 This map shows the different percentage of Asians who graduated at normal time. 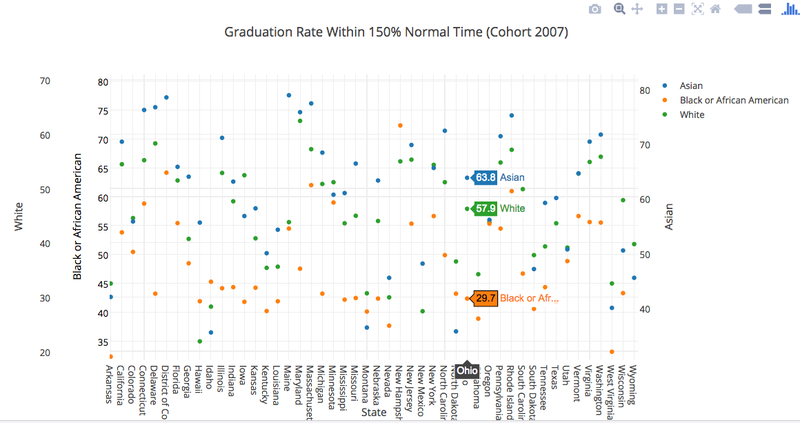 If you click on each state, a pop-up shows the graduation rate for other race/ethnic groups. Even with these two charts, there’s still limitations to visually seeing the data. I’m hoping that in the next couple of weeks, I’ll either find a tool that matches with what I want or I’ll try to manipulate my data more and see what I get. This entry was posted in Uncategorized on November 29, 2015 by Maple Wu. I went to the WordPress II Workshop last night. The workshop was helpful in assisting me refresh some of the things I’ve learned about WordPress in the past. A couple of things we gone over included: Categories, custom menus, pages vs. posts, widgets, plugins, and CSS. I thought the CSS aspect was really interesting. And I’m planning to attend the Advanced WordPress Workshop next Monday to learn more about it. This entry was posted in Uncategorized on November 24, 2015 by Maple Wu. The National Center for Education Statistics (NCES) is a federal entity that collects, analyze, and reports data related to education in the U.S. and other nations. One of their major programs is the Integrated Postsecondary Education Data System (IPEDS), a single, comprehensive system that provides data from the nation’s 9,800 public and private postsecondary institutions. Data includes: Special studies of students, financial aid, postsecondary faculty, and bachelor’s degree recipients, doctoral degree recipients, transcript studies, and various longitudinal studies. 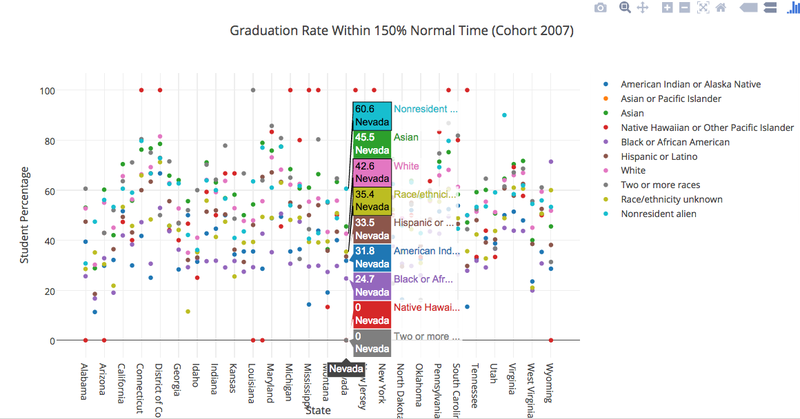 What are the percentage / number of Asian / Asian or Pacific Islander students who graduated within 6 years of their studies by state / geography? How do these data change over the course of the years? How do these data compare with other race/ethnic groups? How does gender (male/female) change the outlook of the dataset? I plan to test out various mapping and data visualization tools and see how my dataset plays out. This entry was posted in Uncategorized on November 5, 2015 by Maple Wu. Just ran across a site that might be of interest to those interested in postcolonial, or more generally, social justice approaches to DH. Social Justice and the Digital Humanities is a site that emerged from one of the courses at HILT 2015 (Humanities Intensive Learning and Teaching). The three-day intensive course combined theory and praxis, similar to our class. Discussions included questions about: access, material conditions, method, ontologies and epistemologies. I like that much of the content are questions, followed by further readings/references. It also included a list of DH projects with a social justice approach in mind. One project I thought was pretty cool is Map of Native American Tribes . Aron Carapella, a self-taught mapmaker, mapped out original names and locations of native american tribes before their contact with Europeans. This transformed the entire makeup of how we visualize the map of the United States. This entry was posted in Uncategorized on October 7, 2015 by Maple Wu. Here’s two articles relevant to some of our class discussions thus far. The first, Five Ideas for Digital Labor History, is a short piece by Tobias Higbie, Associate Professor in History at UCLA, in which he presents five ideas that labor historians can engage with DH. The second article, Laboring Wikipedia, follows up on Higbie’s use of Wikipedia as a class project for students to engage and collaborate in course materials. As a final class project that replaces the traditional term paper, students from his upper division labor history lecture create/edit Wikipedia entries on topics relevant to the class. Some things he highlights included project process, student experience, and future changes. This entry was posted in Uncategorized on September 27, 2015 by Maple Wu.